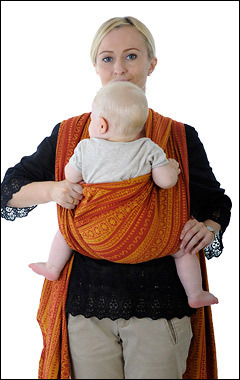 Front Cross Carry is an easy carry to pre-tie and then pop the baby in and out of as you go about your day, for newborn through toddler. Step 1. 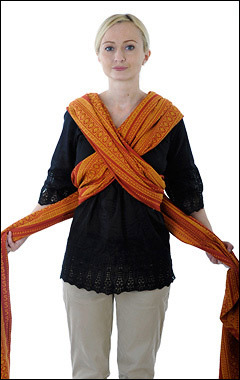 Center the wrap behind your back, immediately under your arms. Step 2. Bring each side around your waist and cross to the opposite shoulder. Step 3. 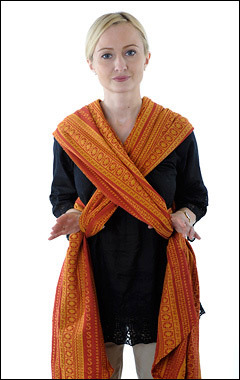 Cross the wrap ends behind your back and bring around your waist to the front. Step 4. For a regular FCC, simply tie a knot at the front and skip to inserting baby – step 7. For Knotless FCC, pull the wrap away at your sides as in this picture. Step 5. Bring the wrap end up under the loop, and thread it through. Step 6. Loop the other wrap end through the wrap at your other side. Step 7. Bring baby up to your shoulder as if to burp, and lower first one leg . . . Step 8. . . . and then the other leg, each through one cross. Step 9. Spread the inner cross completely knee to knee and from armpit to armpit (or shoulder to shoulder with a younger or sleepy baby). Step 10. Spread the outer cross to form a seat under baby’s bottom and spread completely across baby’s back. Step 11. Tighten the wrap around your baby by pulling strand-by-strand on the fabric hanging at each side. 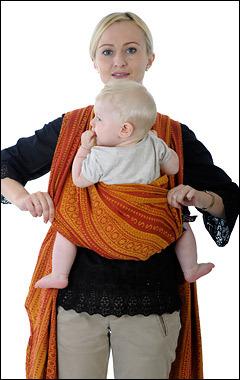 Keep a hand on baby until the wrap is supporting baby securely. You can leave the carry like this for a Knotless Front Cross Carry. Step 12. Or, if desired, take the wrap ends and tie a double knot under baby’s bottom. 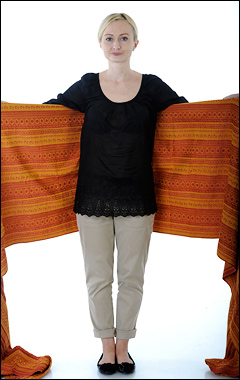 Benedicte has demonstrated using an Ellevill Zara Curry wrap in the above tutorial. 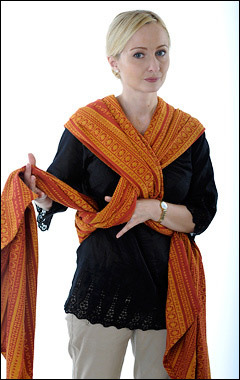 Ellevill wraps are thin and airy, with an open weave that makes them very supple so they conform perfectly to your baby’s shape, and also allows for airflow so these wraps are great for Summer. The all-cotton or linen blends are strong and supportive for all ages and weights of baby or toddler, while the bamboo blends are super soft for younger babies. Ally is using a Rainbow Baby Easycare wrap in the video. Easycare wraps are thin but strong and supportive, perfect for babies and toddlers of all ages and for hot climates or individuals who run hot. 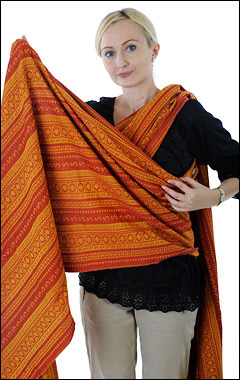 They are also soft and easy to use, a wrap I recommend for beginners. 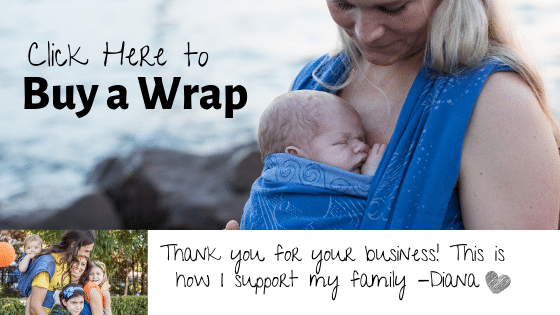 A wrap with stripes can also help a new wrapper keep the wrap straight (untwisted) and to tighten effectively since they can see which color is the one that has slack in it and needs to be pulled out!